BANGI, 10 Apr 2014 – The Keris Mas Residential College of The National University of Malaysia (UKM) which held its annual carnival here recently received a donation of RM10,000 from Deputy Works Minister, Datuk Rosnah Abdul Rashid Shirin. The carnival is held like a family day with the participation of UKM staff and students from other residential colleges as well. They also took part in the various activities and performances carried out. Datuk Rosnah who officiated the closing ceremony congratulated the staff and students of the college involved in organising and taking part in its various activities and programmes. She hoped that the carnival would be continued as annual event as it helped to impart organisational skills while polishing the talents of those taking part in its various activities. Datuk Rosnah said programmes such as the carnival can test their skills and professionalism to see how well they can cope with pressure and stress. Organising such events will also help build their confidence while honing in their soft-skills which they will need after graduating. 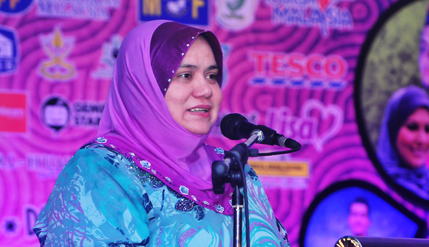 She thanked students of the college for carrying out various activities at the MARA Junior Science College (MRSM) in her constituency in Kota Kinabalu Sabah which had helped the students there achieving the best result in the overall school standings in Sabah. She hoped they will continue their relationship with MRSM KK to continue motivating and inspiring the school children there to achieve success enabling them to continue their studies in universities. Among the highlights of the carnival were performances by artists Sabhi Sadhi, Kelangit Band and Alif Aziz which ended with fireworks and a flashmob performance by the students encircling Datuk Rosnah as she left the event. Deputy Vice Chancellor (Students and Alumni Affairs) Prof Datin Noor Aziah Hj Mohd Awal also attended the closing event.